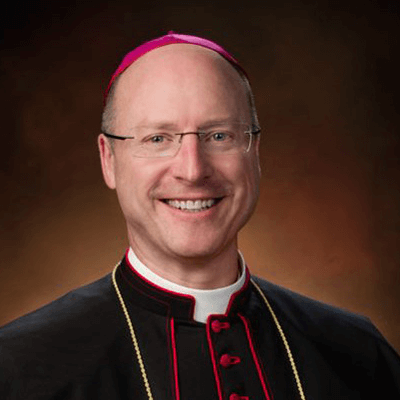 Bishop W. Shawn McKnight was born on June 26, 1968 and grew up in a large Catholic family and attended Catholic schools. He was ordained a priest for the Diocese of Wichita on May 28, 1994. He earned a Master of Arts degree and a Master of Divinity degree from the Pontifical College Josephinum (1993-1994) and earned a Licentiate of Sacred Theology from the Pontifical Athenaeum of St. Anselm in Rome in 1999. Bishop McKnight served as chaplain at Newman University in Wichita from 2000 to 2001, where at the same time he was an adjunct professor of theology and visiting scholar at the university’s Bishop Gerber Institute of Catholic Studies. In 2001, he earned a Doctor of Sacred Theology, also from the Pontifical Athenaeum of St. Anselm, and wrote a dissertation on the permanent diaconate. He later taught liturgy and homiletics at the Pontifical College Josephinum seminary from 2003 to 2008, where he also served as director of liturgy, dean of students, director of formation in the school of theology, and vice-president for development and alumni relations. From 2010 to 2016, he served in Washington, D.C., as executive director of the U.S. Conference of Catholic Bishops’ (USCCB) Secretariat for Clergy, Consecrated Life and Vocations. Bishop McKnight also holds a Bachelor of Science degree in biochemistry from the University of Dallas. He was pastor at the Church of the Magdalen in Wichita, Kansas from July 2016 to January 2018. He was ordained the fourth bishop of the Catholic Diocese of Jefferson City, Missouri on February 6, 2018.